Would you buy someone a second hand gift? Would you be pleased to receive one? Second hand gifts are a contentious issue. Many of us feel that only new items carry the weight of a generous spirit. Second-hand can come across as stingy if it’s not done right. Personally, I think buying second hand is not only a great way to save money, but a way to cut down on all the stuff we buy that just ends up as clutter. When my mother was young, just before Christmas her doll would take a trip to the doll hospital. And then for Christmas, she would be gifted the same doll, all fixed and dolled up. When I think of all the toys my kids have that never get played with, and the statistic that the average kid owns 238 toys but only plays with 12 daily, doing up a favourite dolly makes so much sense. It sounds nice in theory, and maybe second-hand gifts would be fine for the immediate family, but what about extended family and friends? What about that fussy relative with the high gift expectations? There’s a trick to pulling off second-hand gift giving: like any gift giving, you have to match the item to the recipient. You can’t just give any gift, it should be something your recipient will love, be it brand new or pre-loved. And you need to start planning early to give yourself time to source that perfect item. The shops start early. By September, all the decorations are out and the trees are trimmed. They want you to start thinking about Christmas early so that you spendmore money. But you want to start thinking about Christmas now so that you can save money. To start planning now for second-hand gifts, write a list of all the people you need to give a gift to. Then write down some gift ideas that you think that person would like. Now prowl. Second-hand stores, Gumtree, Facebook Buy and Sell pages, garage sales, classifieds. It won’t be long until you find the perfect item. And thanks to technology, this doesn’t mean weekends spent in op-shops (although that’s always a fun way to pass the time), it can mean browsing Gumtree on your phone, on the couch, in the ad breaks. Last year, Australians spent $45 billion dollars in the period leading up to Christmas. That’s an average of $2,500 per person over the age of 14. Do those stats blow your mind, because my mind is still reeling? How much of that is debt? While it’s great to be generous towards others, digging yourself into debt to do so is crazy. If you cast your mind back to last Christmas, how much of what you and your family received ended up as clutter? Even if we all just bought one second-hand gift, that would be millions less ‘stuff’ produced and kept out of landfill. 1. Pre-loved games: Whether it’s a game for the Xbox, a game of scrabble in good nick, or a jigsaw puzzle, a good way to save on games is to buy them second-hand. A lot of Xbox/ PlayStation games are only ever played once. When the player has reached the end, the novelty of the game is over – their boredom is your gain. Things to look out for: make sure the game doesn’t need a code or key to unlock. PC games are more likely to be locked to one user only (what a waste!). Some PlayStation and Xbox games have extras that can only be unlocked with a password. Before buying, check the disc for scratches. If you’re buying pre-loved board games, check that all the pieces are in the box. You may need to download instructions for play. While it may not be possible to check that all puzzle pieces are in the box, especially for big puzzles, go home and do the puzzle to make sure there’s no pieces missing. There’s nothing more frustrating than a large puzzle with a piece missing! I’ve had great success buying kid’s puzzles second hand. They are some of the most loved puzzles we own. 2. Classic Books: We have a lovely 1970s edition of the Complete Winnie-the-Pooh that we purchased for the kids second-hand and that I wouldn’t hesitate to gift to someone else. When book stores are full of Disney franchise merchandise, it’s hard to find really nice books anymore, unless you get them second-hand. But you don’t need to stick to classic books or first-edition books to gift second-hand books. Imagine giving (or receiving) a whole series instead of just the first in the series and buying it for the cost of a single book! 3. Vintage accessories: Not used darling, vintage! What girl doesn’t like a little vintage bling? It’s amazing what you find in pawn and second-hand shops. Stunning jewellery for a fraction of what you pay for it brand new. Don’t just think jewellery though. Handbags, vintage suitcases, hair accessories, fountain pens, stationery or desk sets, jewellery boxes, perfume bottles, silk scarves can all make great gifts for the right person. 4. Antiques: Finding genuine antiques at frugal prices requires a bit of ingenuity and scouting, which is why it’s a good idea to keep gifts in mind when you’re op-shopping. But bargains are there for the savvy buyer. The key is to look for quality at your price point. And of course, match the gift to the tastes of the recipient. Garage sales can be the best place to pick up cheap antiques, because sellers don’t always know what gems they have on hand. But you have to get in early and beat the trade buyers who know what they are looking for and can sniff out a bargain at 50 paces. 5. Collectibles: Know a collector? I know a person who collects plates (the ones you hang on your wall) and always welcomes more plates to her collection. Sure, you can pick up a plate in one of those little kitsch shops, but a vintage plate, particularly a limited edition one, would be all the more welcome. 6. Fabric Remnants: If you’re a sewer, fabric remnants can be turned into gifts! Quilts, placemats, cushion covers, children’s clothes, dolls clothes, table cloths, napkins…The fabric remnant bin at our local Salvation Army store is the first place I head when bargain hunting! 7. DVDs: If you look for DVDs in good nick, then you won’t even be able to tell they are second-hand. Like games, DVDs are often only watched once, sometimes not even that, if the DVD in question was a poorly chosen gift. Before buying a second hand DVD, always open the case and check the disc for scratches or damage, especially if it’s a kid’s DVD! 8. Hamper items: Personalised hampers can make a lovely gift, and you can pick up some great hamper items second-hand. A tea hamper could include a vintage cup and saucer. A wine hamper could include wine glasses. You could use some of the ideas below to couple second-hand, up-cycled tableware and linen with homemade preserves and baking. At the very least, an op-shop is the best place to look for hamper baskets, but I like to think outside the basket, and pack hampers on serving platters or even in bags that can be used again. 9. Linen and Tableware: Why pay full price for a serving platter, salad servers, cake sporks, tea pots, wine glasses, table cloths or other tableware you can probably pick lovely ones up second-hand. A nice tea set for the right person, for example, will always be appreciated, whether brand new or second-hand (and you probably won’t be able to tell it’s second-hand). Think about ways you can take second-hand items to the next level by adding your own crafty touch. This video tutorial on how to add beads to serving spoons and other flatware is a lovely example of how you can improve on and personalise the second-hand items that you buy. You could embroider a tablecloth or stencil placemats, paint a vase or decorate a serving platter. 10. Autographed items. There are some things you often can’t buy brand new. A special addition or autographed item can be a very welcome present for the right person. But you have to keep your eyes peeled for these rare finds. Garage sales are a great place to find under-priced autographed items. 11. Classic or quality toys: If you look in the toy section of a second-hand store, it’s often filled with ratty, broken, plastic Fisher Price toys. These are not the type of toy that makes good gifts. Instead, classic or quality toys like wooden toys in good conditions, Barbies in good condition (here’s how you can restore a Barbie doll; you can also make it an awesome gift with a whole bunch of homemade clothes and accessories to go with the doll), Lego (here’s how to clean Lego), Melissa and Doug*, Plan Toys*, HABA* (these are some of the quality toys we have loved – keep an eye out on Gumtree for them!). Don’t forget to keep an eye out for second-hand clothes and accessories that would make great dress-up sets, maybe with a little up-cycling! 12. ’New’ Second-hand items: Here we come to the re-gifted item. The unwanted present from last year that hasn’t even been opened. You could really say these items are not even second-hand at all. Look on gumtree and Facebook groups straight after Christmas for a whole host of re-gifted items. Just be sure not to make the same mistake – buy something your recipient will like so your gift doesn’t get re-gifted! 13. Bikes: ALL our bikes, when I was a kid, were second-hand. My grandfather built them from bits and pieces and when he died, my father built them. A bit of tender loving care and a new coat of paint and bikes can look and ride as good as new. 14. Sports equipment: ‘For Sale: Kayak. Used once. Perfect Condition. $50.’ Second-hand sports equipment can be a great way for a loved one to get into that sport or hobby they’ve always wanted. Encourage them by getting them the equipment they need at a fraction of the cost of brand new. And if you sparks a passion, they can always upgrade their equipment as they progress. 15. Art: Art can be a difficult gift to give unless you know the tastes of the person you’re buying for. Second-hand stores, garage sales and eBay are great places to pick up old artworks. And who knows, you may be lucky to pick up a genuine collectable stashed at the back of someone’s garage. At worst, you can pick up some good frames to up-cycle. Framed scrapbooking paper, wallpaper or fabric can make lovely art, especially when you group more than one frame together. Or you could up-cycle the frame into something else, like this serving tray from a picture frame. Gifting second-hand items doesn’t have to be tacky. The key is to always, always match the gift to the recipient (this holds true for brand new gifts too). If it’s still in good shape and it’s something your recipient loves, then it won’t matter how many people have pre-loved it. What are your thoughts and tips on buying second-hand gifts? There’s a line in the film Fight Club where Tyler Durden tells The Narrator, “The things you own end up owning you.” This is later reinforced in the Chuck Palahniuk novel/David Fincher movie when members of the chaos-driven group of radicals Project Mayhem are instructed that two black shirts, two pairs of black pants, a pair of black boots, two pairs of black socks, and a black jacket are the only personal effects a person needs in their life. While Project Mayhem was a destructive group of anarchists, something about that quote always stuck with me. That isn’t to say I’ve lived a minimalist lifestyle since first watching the film. Rather, I’ve noticed how I rationalize keeping things that I don’t really need, much in the same way Edward Norton’s character dealt with his insomnia through retail therapy. More often than not, when life gives people problems, they reward themselves with things. But ultimately, these items will never fill the void in your life. Over the years, my closet became particularly problematic. I discovered that most of my wardrobe was a series of uniforms for tasks, social situations, and bygone eras that no longer reflected who I am. Here are the other major takeaways for those wanting to hit the reset button and clear out their closet. One of my earliest revelations was that I was only wearing about 10 percent of my clothes. And not surprisingly, they were most often on the shelves and hangers closest to the front, meaning I prioritized how easily I could access something over what I actually preferred. 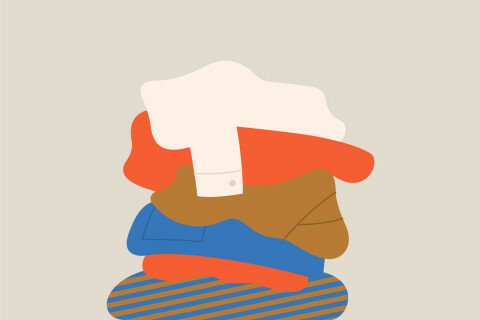 Put simply, if you like something and you want to keep on wearing it, place it front and center after your closet clean-out. But people should be aware that ditching items isn’t as easy as it seems. In 2012, researchers at Yale discovered that two areas in your brain associated with physical pain — the anterior cingulate cortex and insula — are also impacted by ditching clutter (even unwanted clutter). That isn’t to say the initial purge was like getting my finger jammed a door. It was more a feeling of emotional ineptitude for having let my closet get into such disarray in the first place. If you go to the gym every day, it would make sense to have lots of athletic-type clothing. Conversely, if you’re a lawyer, it would make sense to have more suits than the average Joe. Once you recognize where you go with frequency, it’s easy to understand what you actually need. There was a time when I went to an office five days a week. While the atmosphere was decidedly casual, it still required a bit of dressing up. Many of my shirting options were traditional Oxford button-downs in a variety of different colors. But when I ditched the office job, the Oxfords still kept their place in my closet despite no longer being a “uniform” that matched my lifestyle. For a while, I reconciled that those shirts still had a purpose, when the truth was, in the back of my mind, I figured I’d once again have to slink back into office life when freelancing didn’t work out. A 2011 study by the Journal of Consumer Psychology reveals that objects you struggle to get rid of are likely tied to your self-worth. In my case, the notion of “stability.” Sub-consciously, the shirts were a reminder of what I could go back to, instead of what I wanted to do moving forward. While we often think of items in our closet as being sartorially dated, even stylish contemporary pieces can become “old” depending on your situation. So I’ve now learned that when a life milestone occurs, your closet should reflect that. Many publications that dish out fashion advice often add “get multiples if you can” as a way to illustrate the timelessness of a piece and how several color choices would be a wise investment. Items like jeans, crewnecks, polos, bombers and so on all fit the bill. This was probably my biggest problem. I’d found pieces I really liked and then took the idea of “multiples” to the extreme. I had unwittingly become a collector. 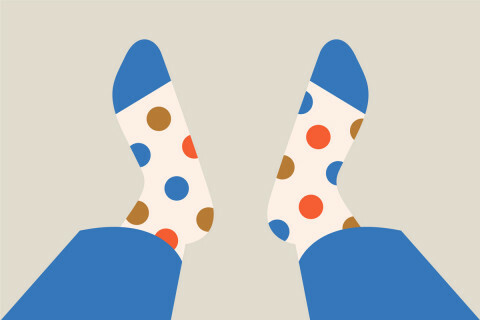 In turn, I often found myself feeling like I was always wearing the same thing. I now understand that just because something is a different color, it doesn’t mean it warrants a purchase. When packing for a trip, I often go overboard on shirts but rationalize my pants selection by saying, “I can get away with the pair of jeans I’m wearing to the airport and an emergency pair in case I spill something on them.” This attitude shouldn’t be reserved for short excursions, it should be the mantra for your trouser game, period. Jeans don’t need to be washed regularly like other items. 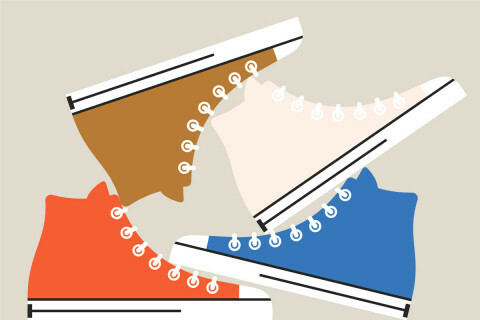 A single pair can keep its place in your rotation for several weeks. Mix in another pair of jeans, a pair of chinos or two for diversity, two pairs of slacks, and a guy should be fully equipped for all social occasions with just six pairs of pants. Whether it’s Christmas, Hanukkah, or a birthday, there are several events a year when you can expect to receive gifts. Even if you and your loved ones swear off anything major, smaller items such as T-shirts, socks, or other accessories are still pretty common gifts — especially if you’re lacking inspiration. This was another huge problem for me when dealing with my closet clean-out. Gifts are problematic on two levels: they come unprompted and they’re picked out by someone else. This creates a scenario in which you feel obligated to keep something when there’s also a good chance you probably don’t even like the item to begin with. This is the perfect storm for clutter. And as research suggests, clutter competes for your attention and leads to decreased productivity and unwanted stress. A better suggestion would be to consider asking for “experiences” instead of things. Go out to eat or to a movie. Strengthen your bond with someone who values you enough to show you a token of their love or friendship. More and more, we’re moving toward a concierge-style economy in which people are placing convenience above all else. Charities such as The Salvation Army were collecting donations many years before ride-sharing and deliverable groceries became all the rage. 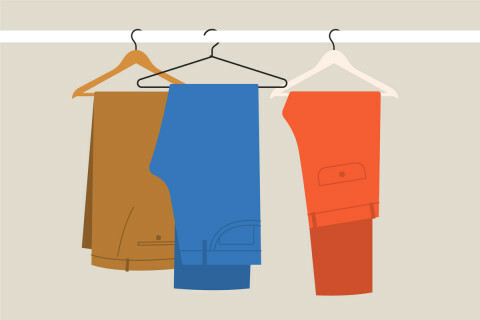 Those who have successfully completed their closet clean-out can simply schedule a pick-up. 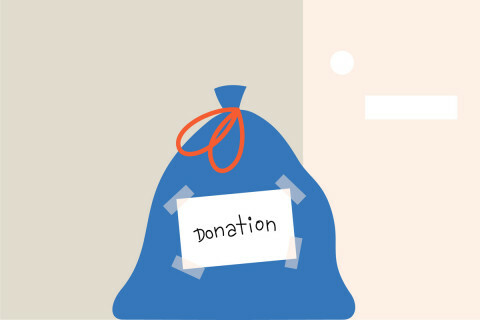 Box or bag up your unwanted goods — although I recommend skipping on the old underwear, socks, or items with permanent stains — and leave them by your door. Not only is an act of charity good for the soul, but it’s also tax deductible. If you believe that your unwanted clothes warrant a return on your investment, consider looking into options on how to resell hyped goods, exploring the sneaker aftermarket, and identifying the proper marketplace for used items. 1. If you’re unsure about how much you actually wear an item of clothing, arrange all your hangers so they’re facing in one direction. 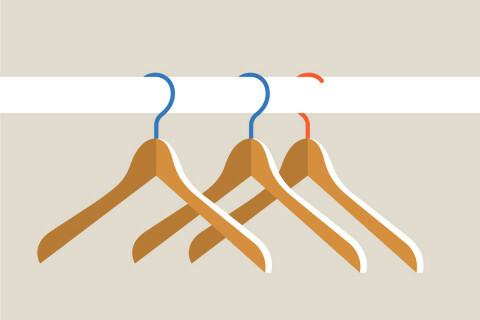 When you wear something, turn the hanger in the opposite direction. After a month, you should have a good sense of what has made the cut. 2. Follow the “one in, one out” rule. If you buy something, the natural reaction should be to get rid of or donate something to balance it out. 3. Would you buy it again? Pretend you’re shopping in your own closet. If you love something so much that you’d buy it again, keep it. 4. Closet upkeep should be a weekly task. You wouldn’t clean your bathroom once a year or vacuum once a month. While there is decidedly more change in terms of household cleanliness per week, you can also use that time to reassess your closet. Perhaps you’ll realize that the shirt you thought you wear all the time hasn’t passed your hanger test. Perhaps your shoes have been knocked around and need to be rearranged. 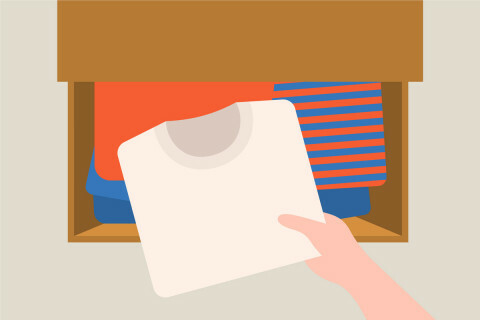 Take five minutes while you’re already in cleaning mode and you’ll never have to do a major closet clean-out again.